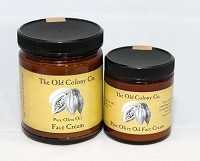 Face Creams & Toners | All Natural, Handcrafted | The Old Colony Co.
What did we do before all the miracle anti-aging serums, creams, lotions and masques on the market today? Answer: we used what nature provided for healthy youthful looking skin: genuine botanical oils and distillations handcrafted into creams and tonics. Often imitated never duplicated, our face creams and toners are the real thing, based on formulations developed centuries ago that have stood the test of time and outlasted the various fads and "scientific breakthroughs" in between.